Who Cares About Online Reputations? Who Cares About Your Online Reputation? Although multiple examples have been provided which highlight the potential advantages and disadvantages of positive and negative online reputations, it is worth mentioning a few additional relationships that an online reputation could positively or negatively influence. Any person or organization that uses economic services or commodities is a viable candidate of someone whose decisions are occasionally, if not regularly influenced by digital information. Alliances between multiple parties in business formation have been around for centuries. Securing appropriate partnership relationships can be risky, and people in business are typically well researched and diligent about their decisions. In many cases, sourcing and establishing business partnerships can be a vital component to a successful venture, where two or more entities join forces to compliment each other. Behind these decisions to create alliances are people. People who use search engines to learn about the people they are considering for a partnership venture. Investing in the ownership of public or private stock in a corporation warrants calculated investigation and decision making about the viability of a prospective business investment opportunity. Shareholders are typically curious, analytical individuals with no shortage of resources to make educated decisions about where to invest or keep their money. Search engines provide a quick and efficient way for stockholders and investors to source information about an organization, product, or an individual before making an investment decision. Professional marketers understand the value of leaving an impression in the public eye. As it is with many in the employment sector, a marketing professional might choose not to contract their services to an organization or individual with an abundance of negative content online in a desire to steer clear of what promises to be an uphill battle in reshaping the reputation at hand. The marketer might also devalue the opportunity if he or she has a limited understanding of how search engines function or the technical aspects of digital content. 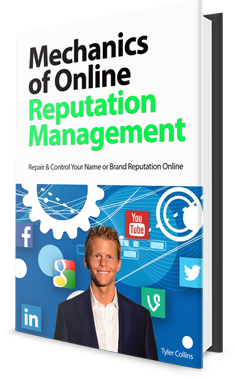 Alternatively, a marketer may use an obviously negative online reputation as a means to secure that same opportunity with the promise of repairing it. The point is, the marketer cares. Or at least, should. Publicists and editors have an uncanny ability to uncover stories, curate, extrapolate, manufacture SPIN, and produce or leverage negative press for attention. Gathering, processing, and disseminating news to an audience is what they do. With or without a professional position, journalists typically have a satiating appetite for newsworthy content. In our current digital world, both the primary tasks and output of journalists are being executed and consumed on the Internet. Combine this with abundant opportunities for publishing on well-trafficked, search engine friendly content platforms, editorial and news content consistently proves to be among the most commonly problematic sources of negative information that invoke the need for online reputation repair. Business owners and hiring managers read cover letters, resumes and applications, and check references before making final hiring decisions. Depending on the employer and the nature of the job, employers often search candidate names in search engines to learn more about the person they are considering for the job or contract. Online research of job applicants is becoming a common practice, if not a standard operational guideline, for many businesses offering employment opportunities. The presence of negative content about a prospective job candidate in the search results consistently serves as a safeguard for businesses navigating the risks involved in making the right hiring choices for their organization. Additionally, some employers will choose one candidate over another if one person’s online presence seems stronger and facilitates the positive impression the applicant intends to make on the employer. There are many examples of how certain individuals lend merit or attach value to another person’s online reputation. Whether they are professional or personal, co-workers, associates, friends or family members, our social-inspired digital society has a governing stronghold on our lives today. Above all others, the person who probably cares the most is you. If you do not, of course that is your choice. However, whether or not you assign value to your online reputation and image, you do have an important life. Your life has value and so do the relationships and things you care about. Whether or not you enjoy it, despise it, or accept it, your life is impacted by the online world. To gain a greater knowledge of how you can access, influence, control, and leverage digital content for greater advantages, continue throughout this book. As you do, you will discover that your reputation, as seen through the lense of the World Wide Web, is ultimately something you are empowered to create, consistently re-imagine, and direct.